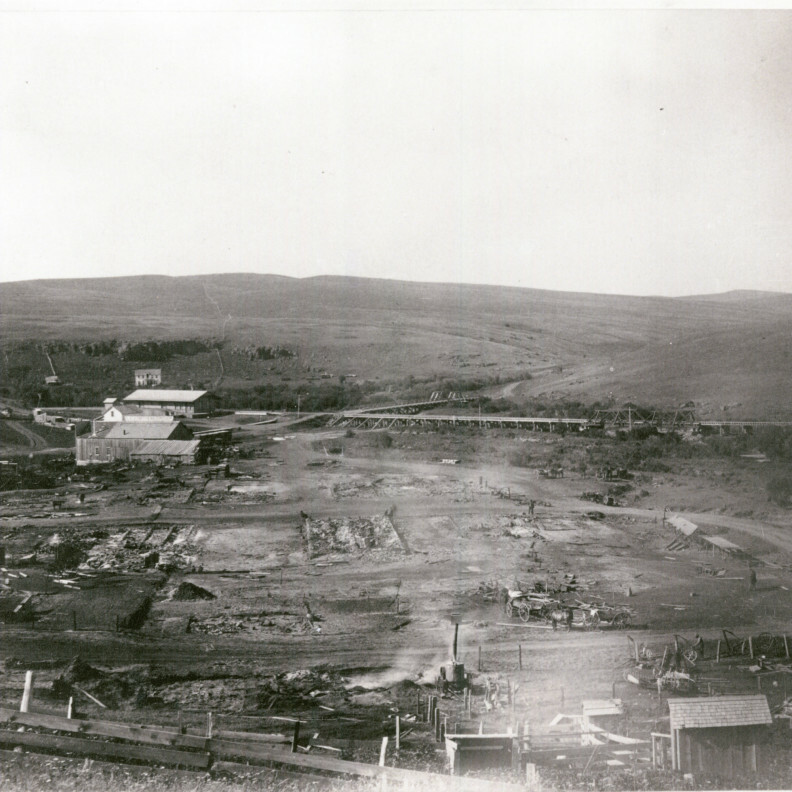 History of the Palouse area dates back more than 10,000 years. Native Americans were here first. Lewis and Clark were probably the first non-native people to set foot in Washington. 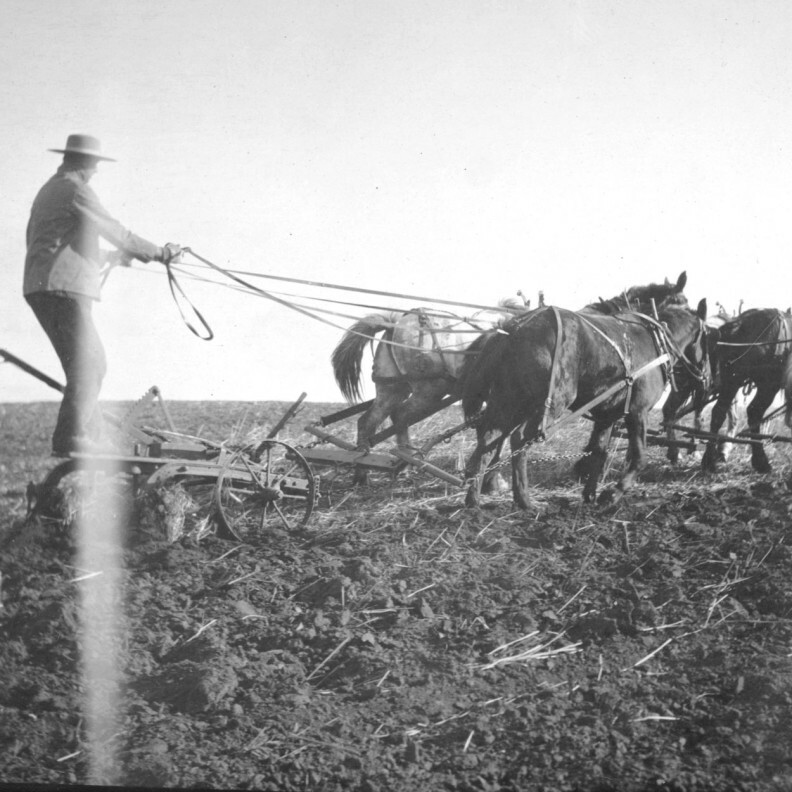 They passed through the Palouse nearly 2 centuries ago on their westward journey. 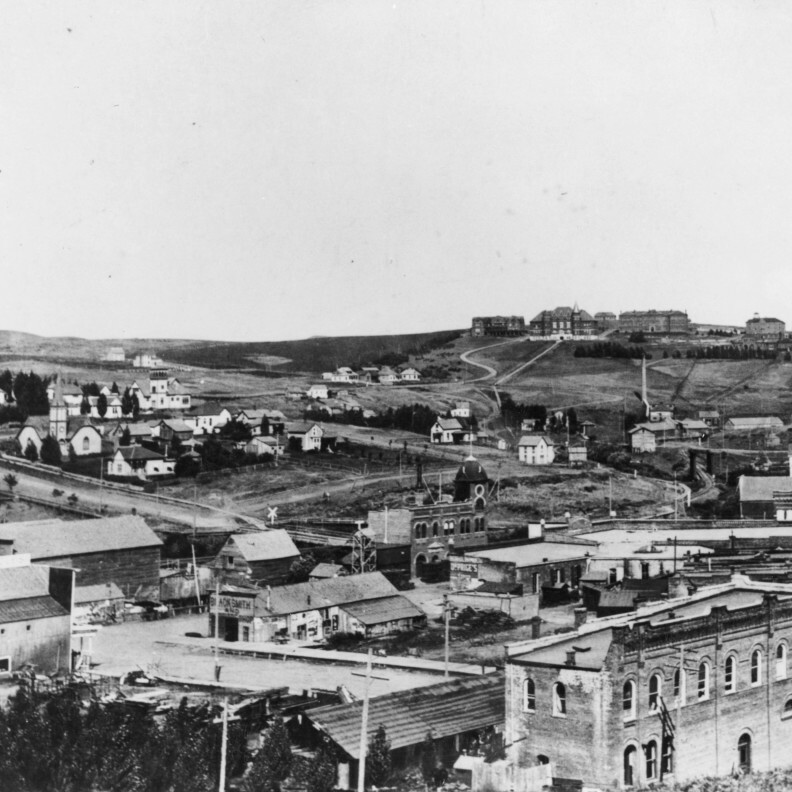 By 1888, there were 250 to 300 people living in Pullman. The town was incorporated in that year and named after engineer and industrialist George Pullman. He was renowned for designing and manufacturing a railroad car with beds for passengers. Just to be clear: George Pullman didn’t live in Pullman, Washington. His famed railcars weren’t manufactured here, either. (They were assembled in the Pullman neighborhood of Chicago.) So why, then, was a rural Washington town named after him? Bolin Farr, a local homesteader, was a friend of George Pullman. He likely named the city in his honor. Differing accounts tell of events that led up to the city’s founding. In June of 1890, a local committee on fire and water advised that the city buy a chemical fire engine and other fire-fighting equipment. Unfortunately, the recommendation came too late. On July 3, 1890, a stable fire on Grand Street spread to the rest of the town. Within 2 hours, it had reduced nearly all the business buildings to smoking rubble. Only the Herald and the hotel remained standing. After that, wooden buildings didn’t seem like such a good idea. City trustees required all business buildings to be constructed of brick. Warehouses were to be covered with corrugated iron. Railroads began crisscrossing America in the late 1800s. They wove Pullman into their iron web. Special trains were the only way for students to travel in and out of town during school breaks. 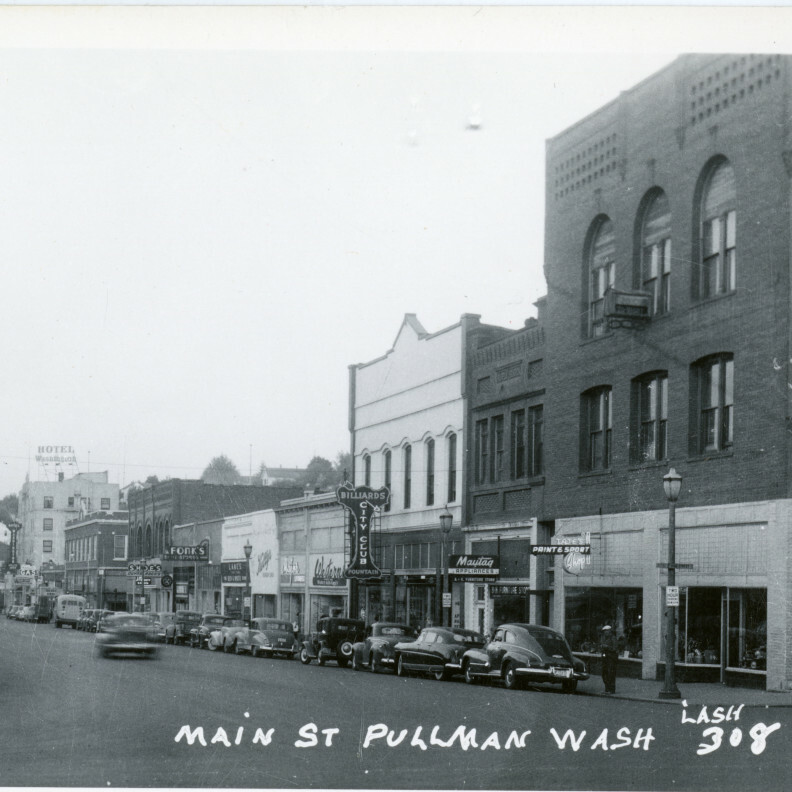 Pullman had a population of only a few hundred people in the late 1800s. Nonetheless it became a station for 3 railway lines. 1885: The first Columbia and Palouse Railway train arrived in town. 1887: The Spokane and Palouse Railroad linked Spokane to Genesee, Idaho. 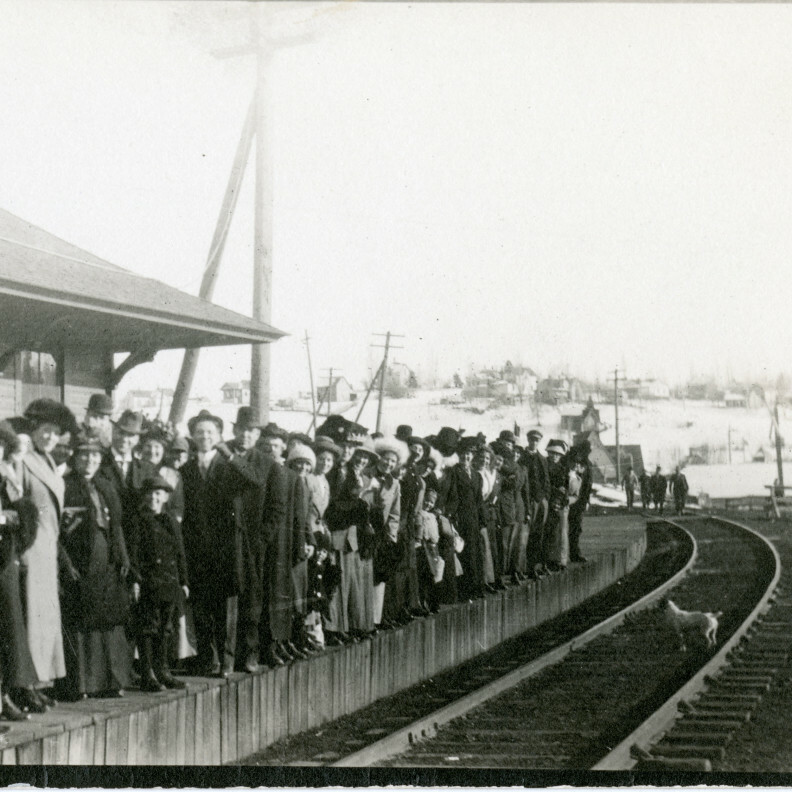 1891: The Northern Pacific line to Lewiston began operation. 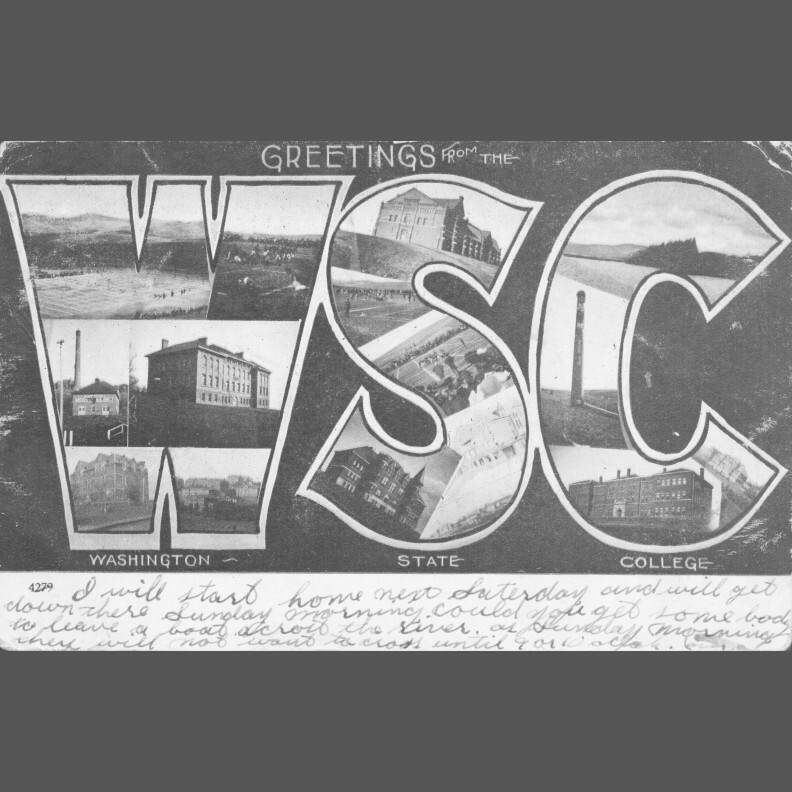 In 1890 Washington’s legislature voted to establish a state agricultural college and school of science. Yakima and Whitman counties were top contenders for the college’s location. A group of men from Olympia were to choose the college site. They visited Pullman to see what the town offered. Locals treated them to a marching band parade and a banquet. The day before the men were to make a final choice, they traveled to Tacoma. They made the trip to visit a proponent of the Yakima site. Things weren’t looking good for Pullman. 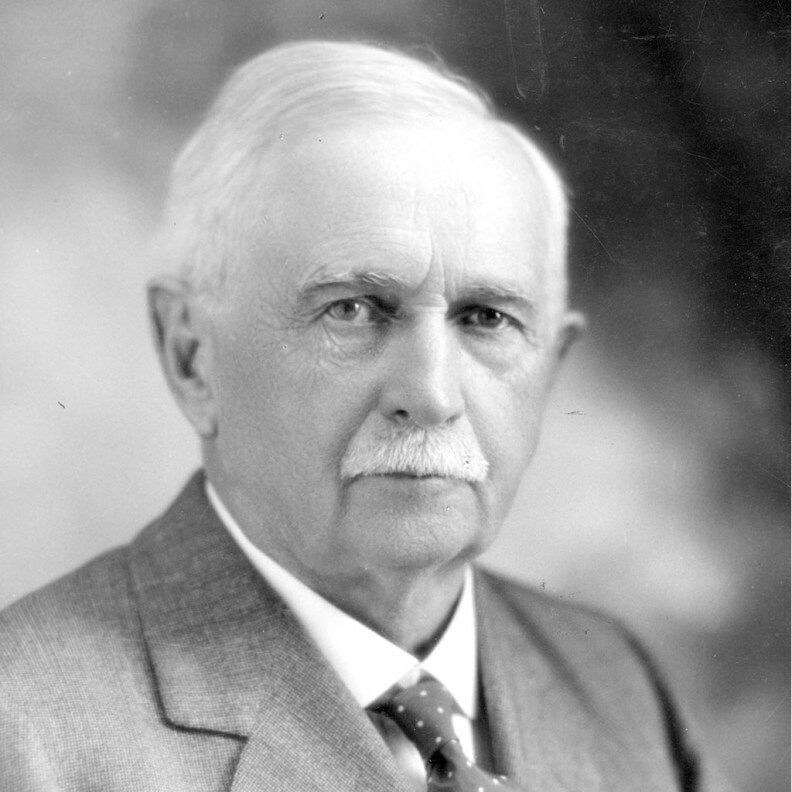 Whitman County Senator A.T. Farris followed the men to Tacoma. He noticed that one of them failed to board the only train of the day back to Olympia. The senator chartered a train and car to deliver the man to Olympia in time for the decision-making meeting. Around midnight on April 18, 1891, the verdict came in. The college would be located in Pullman after all. As dawn broke on Tuesday, March 1, 1910, warm rain began to fall very heavily. By 8:00 a.m. the South Palouse, Dry Fork and Missouri Flat creeks had become “raging torrents, all out of their channels and fast flooding the city,” the Pullman Herald reported. Flood waters stood up to 8 feet deep on Main Street. 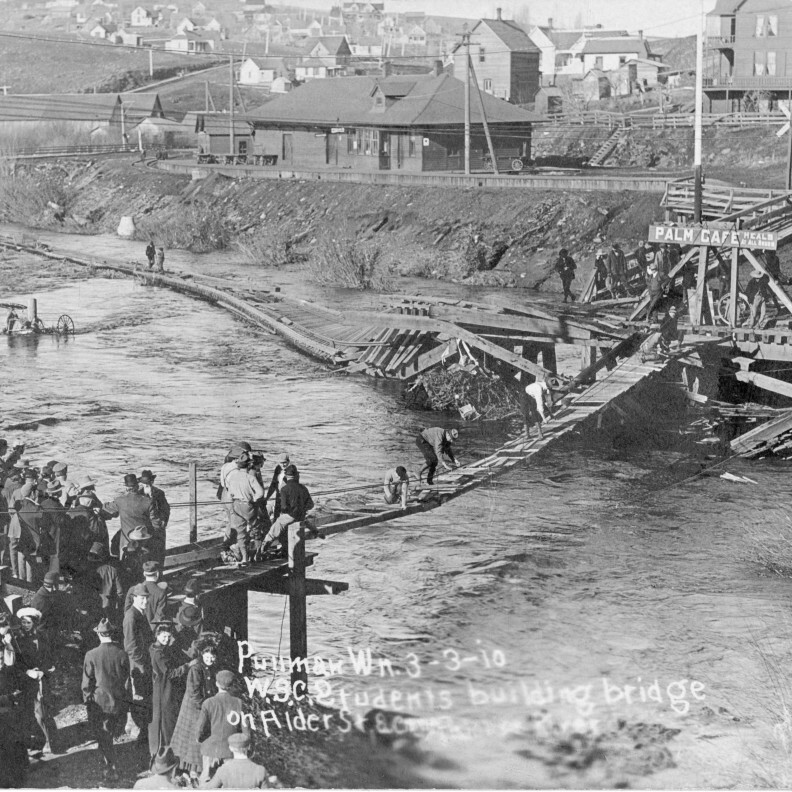 A rapid current swept through town, taking out three railroad bridges. It claimed an undertaking and furniture store, sending coffins and furniture floating away with the hearse. Also lost were a bakery, a tailor shop, and a piano store, its nine new pianos carried downstream. Rising waters swept away four homes as well, according to the Morning Oregonian. The city had no light, no fuel, and no potable water. The Agricultural College was without fuel, but was spared any property damage. Water began to recede by evening. Property damage was estimated to be at least a quarter million dollars. Miraculously, no lives were lost. In 1907, the Pullman Herald dubbed Maple Street “the most dangerous road in the county.” Then called Star Route Street, it was a mail route traveled by horse and buggy. The road was dusty and muddy. In the winter it became treacherous. The Herald described an 18 to 20 foot drop along the side of the road. The Northern Pacific railroad track lay at the bottom. A deadly fall could result if horses ran away while coming down the hill. In 1913 the city began paving roads with red brick to provide traction for horses and automobiles. The street around the tracks at the Northern Pacific Railway depot was paved to help pedestrians. Red brick pavement remains today on 1 block of NE Maple Street and a block of NE Palouse Street. Sunnyside Hill is located to the southwest. The morning sun arrives here first. Pioneer Hill is located to the southeast. It was originally known as Methodist Hill. It was where the Methodist minister and many church members made their homes. On the northeast corner of town, College Hill is the site of Washington State University. 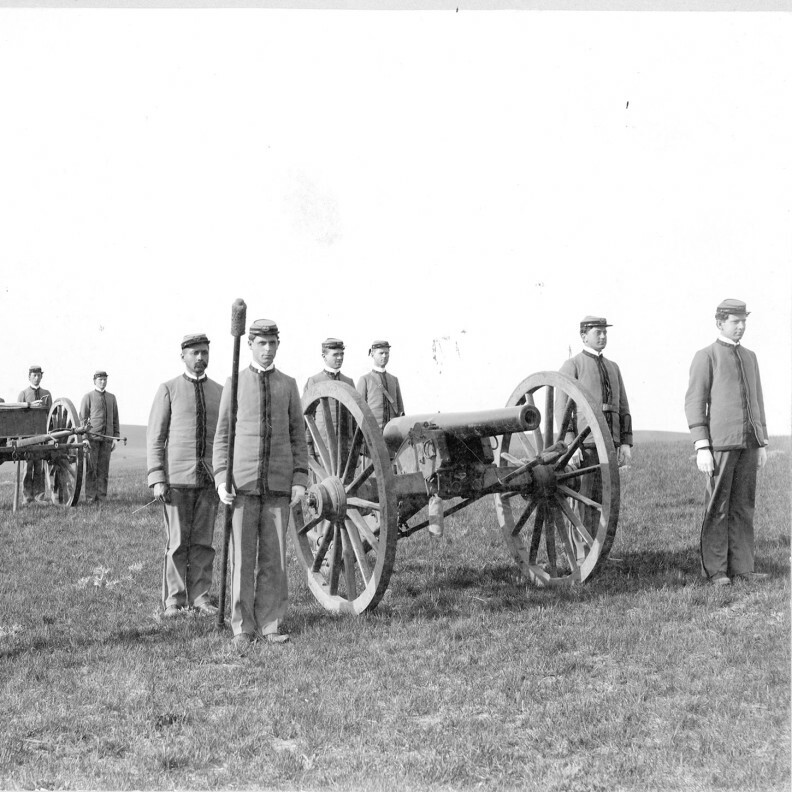 In 1891 townspeople called Pullman’s northwest hill “College Hill.” It was the site of a prep school for young men called Pullman Military College. The military college burned down in 1893. People then renamed the site “Military Hill.” That way it wouldn’t be confused with the other “College Hill,” where the agricultural school stood. 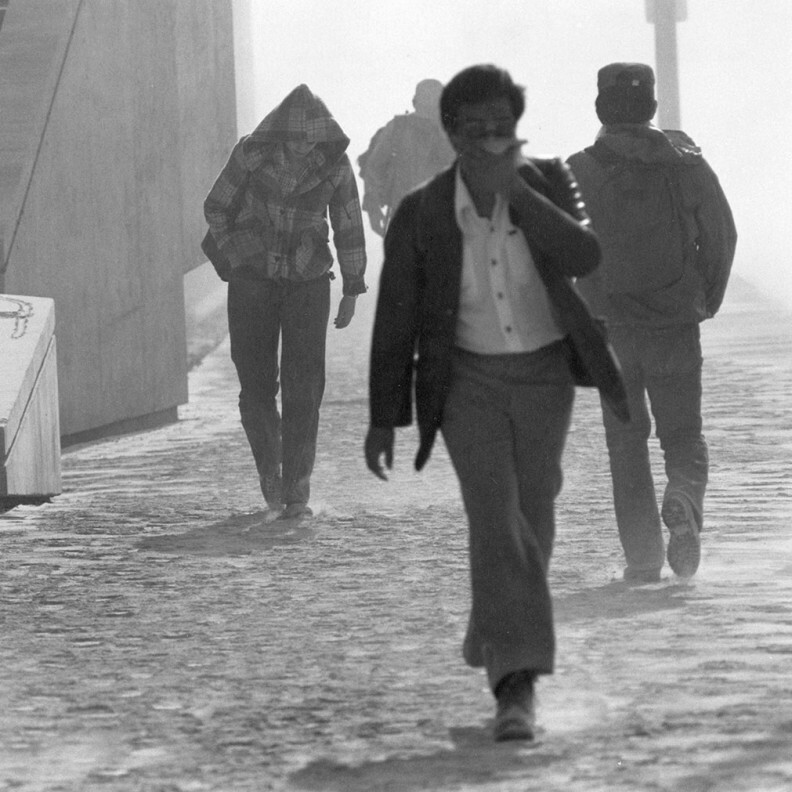 On a Sunday morning in May 1980, Mount St. Helens rumbled into an explosive frenzy. It thrust a 520-million-ton column of dark gray ash into the sky. Winds carried the ash to the east. A few hours later in Pullman, darkness filled the western horizon. It pushed closer and closer until it swallowed the town. Volcanic ash fell like snow. A centimeter-thick gray layer blanketed the streets. Simply walking in the ash kicked up a powdery cloud. Breathing was difficult. Masks were essential. The ash clogged car engines, making driving impossible. Ash from the eruption paralyzed the city. Schools and businesses closed while townspeople disposed of the ash. For weeks, citizens shoveled up the ash and hauled it away.